A monument to St. Nicholas II was installed near the gymnasium on the boulevard of Serbian Emperor Dushan. PRAVMIR. June 23, 2014. 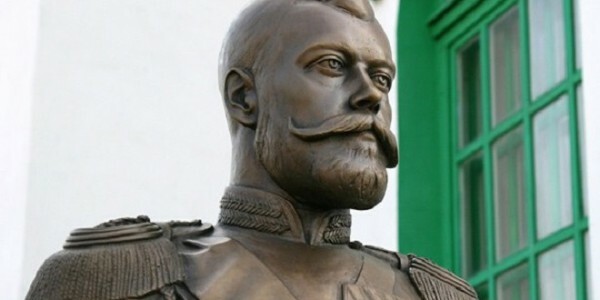 In Banja Luka a monument to the Russian Tzar and Passion-bearer Nicholas II was erected. The ceremony was attended by the President of the Republic of Srpska (Bosnia and Herzegovina), Milorad Dodik, and Russian presidential aide Igor Shchygolev relates Sedmitsa.Ru reports with reference to “Srbin Info”. The monument St. Nicholas II was installed on the boulevard of Serbian Emperor Dushan, near the gymnasium. On the memorial plate engraved in Russian and Serbian is the inscription: “In memory of the Russian Emperor Nicholas II, defender of the Serbian people, and the fallen soldiers of the Serbian Volunteer Corps”. After the blessing of the monument, which was carried out by the Bishop Ephraim of Banja Luka, Milorad Dodik and Shchygolev laid wreaths next to the monument.